BREAKFAST IS NOW SERVED ALL DAY! Your choice of white, wheat or rye bread. Served with chips or fruit. Served with chips or fruit. Grilled Panini Style. Served with chips or fruit and a scoop of Blue Bunny ice cream for dessert! The Old Dairy will have many homemade desserts to choose from daily. Not all desserts will be available every day. We will be happy to accomodate special orders for any of our desserts. Assorted Novelties Available - Wednesday only $.25 off novelty items. All omelets are served with a side of wheat or white toast. At the Old Dairy we offer our exclusive blend of coffee in regular or decaf every day. We are committed to providing the best cup of coffee in town. We use only fresh roasted beans for you to enjoy! Old Dairy Regular or Decaf - Bulk Coffee per lb. Premium Bulk Coffee per lb. Free 20 Oz. Cappuccino or Latte with 1 lb. bulk coffee purchase. In a hurry? Phone ahead! We'll have your order waiting to dine in or carry out! 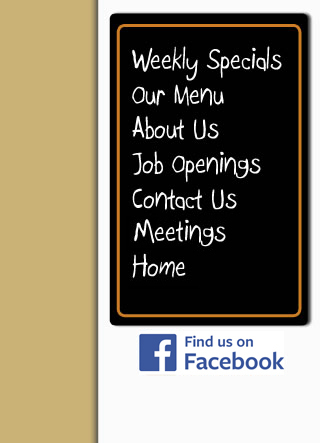 For a pdf version of our menu, please click here.